Blind people truly appreciate the effort, when it comes to presenting them with written material. Giving a blind person a business card that they can read with the touch of a finger will go a long way to cementing a profitable relationship. 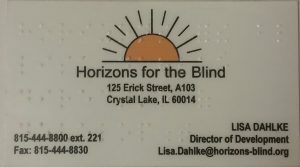 Horizons produces braille business cards by taking your existing card, and creating clear, thin, plastic overlays with the most important information embossed in braille. You will not lose the visual impact of your card to sighted customers, yet you provide a useful tool for your blind ones. Naturally, braille is a little more space intensive than print. 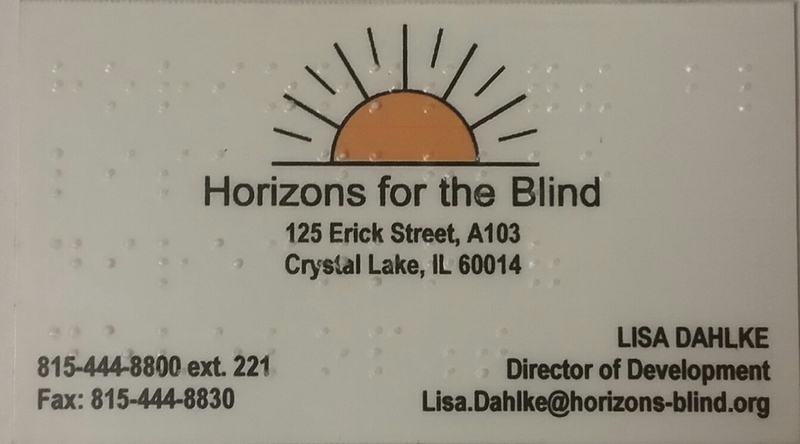 Our experts will help you prioritize the information and manner of braille presentation so that your cards will still have maximum impact. Contact us today at 815-444-8800 to discuss your needs and obtain a free estimate.